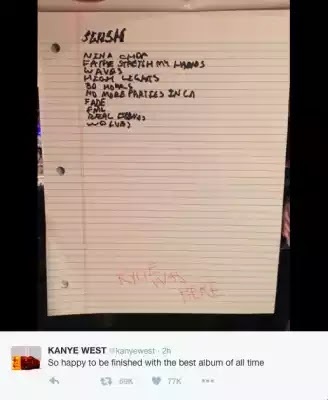 The clique you can trust: Kanye West release Tracklist of "The best album of all time"
Kanye West release Tracklist of "The best album of all time"
Kanye West released the tracklist for Swish, which he dubbed with characteristic humility, “The best album of all time.” Early Monday morning, the rapper tweeted a handwritten list of the just 10 songs that made the cut for his seventh solo album, which is set for release on February 11. Interestingly, his sweet and soft song about his mother Donda and daughter North, “Only One,” featuring piano and vocal accompaniment by Paul McCartney did not make the album, nor did his other collaboration with the legendary Beatle and Rihanna, “FourFiveSeconds,” which the three performed last year at the Grammys. Missing as well from Swish is “All Day,” which West debuted at last year’s Brit Awards and performed when he closed out the 2015 Billboard Music Awards.